Our church and service groups help with collections for community groups such as Hope House, Rachel House, Our Redeemer Lutheran Church. Watch for announcements in the weekly bulletin and monthly newsletters for how you can help. 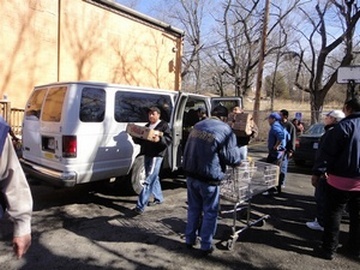 Serving our neighbors by assisting with food distribution at Jesus El Buen Pastor (Jesus the Good Shepherd) Lutheran Church on Mercier St. in Kansas City.